Home computer Technology surface pro 5 : Microsoft has unveiled its new laptop! surface pro 5 : Microsoft has unveiled its new laptop! Microsoft introduced its newborn: Surface. A device sold at high price that would rank among the premium laptops of the moment. It should compete with Apple's MacBooks. Surface: Microsoft has unveiled its new laptop! 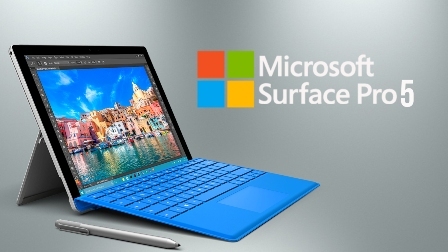 Microsoft introduced its newborn: microsoft surface. A device sold at high price that would rank among the premium laptops of the moment. It should compete with Apple's MacBooks. The dogs are dropped. Microsoft announced during its conference for education its new surface pro 5 . A device designed to compete with Apple MacBooks as well as laptop under Chrome OS. The camera has a 13.5 "Pixel Sense display . A touch screen that works with the Surface Pen. The thickness of the laptop is 14.5 mm. Not more than 900 grams . The keyboard alcantra, already embedded in the Surface Pro 4, will be part of the game. A jack, USB, USB-Type C and mini-display will be present. A prowess that puts it alongside the finest laptops of the moment. The autonomy announced is 14.5 hours . Regarding the other technical characteristics, it would seem that the microsoft surface benefits from an i7 or i5 processor . On the software side, the device seems to run on the new Windows 10 S . A leaner version of Windows 10 only runs Windows applications, including the office suite. It will be possible to upgrade the S version to a Windows 10 Pro version. Microsoft has taken special care of the camera's finishes. Consumers will have the choice between 4 colors visible in the video. The notebook will be available from June 15, 2017 at the price of $ 999 . The input ticket concerns the microsoft surface with a Core i5, 4 GB of RAM and a SSD of 128 GB. The announcement was made during a very special conference. No doubt Microsoft hopes to see its next Surface in the hands of students. It is not uncommon, especially in the Parisian amphitheaters, to see young people with their Mac Book Air or Pro. A trend that could be reversed with the appearance of an innovative and powerful product.